Shine a Light: Dunk, Drunk, Mission Beach .. and Fare thee Wells! Dunk, Drunk, Mission Beach .. and Fare thee Wells! 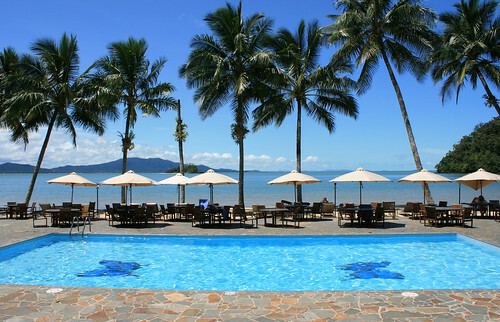 This is what Dunk Island resort looked like before cyclone Yassi. From Flickr. Dunk Island is lovely. The view from our anchor spot is the picture of a South Pacific haven - blue/green crystal clear water, palm trees and calm breezes. This island has a long history of refuge. The original European settler (after the indigenous Aboriginal people disappeared) was Edmund Banfield, a journalist in Townsville who, with failing health, was searching for his personal paradise. He moved on to the island and established a home for many many years. While there he kept a diary of the wildlife and the beauty of the island which later became 4 famous books - the most well know is "Confessions of a Beachcomber" published in 1908 and still available today (on e-books no less!). When he died he wanted the island to become a research centre for tropical biology .. but it didn't. Dunk Island became a very popular resort for families in Australia and around the world. There also used to be a very famous artist enclave on the island dating back to 1974. Sadly, this is what's left of the resort today. Unfortunately Dunk Island, the resort and the artist enclave, took the full impact of cyclone Yassi - a category 5 cyclone - in February 2011 and there isn't much left but ruins. The federal government together with the local council have replaced the old wooden pier with a new concrete one and they are working to get the camping areas back up to scratch. According to the news the resort was bought by someone who is planning a super upmarket resort on the site. It will cost a lot of money and time to do that here. The drunk in the title of this blog refers to our first night here and the pot luck dinner on 'Bogart'. We weren't really "drunk" .. but let's just say the wine flowed freely! As 'Southern Belle' and 'Bogart' left The Hinchinbrook Channel and approached Dunk Island - Sharon sent me a text saying that she was inviting us and 'Whimaway' to a pot luck dinner that night. "Sounds Good! ", I replied. So after walks on the beach and swims we joined everyone for dinner that night about 6pm. The company, conversation and food was excellent - as usual - and the night kicked off in high spirits. Once dinner was finished the music was cranked up and we danced! Well Sharon, Donna and I did the best we could to dance in the rather restricted confines of a 45ft boat with 7 people aboard! What a fun night! I don't have any photos - probably a good thing - because I left my camera on our boat. But Sharon documented the whole thing .. so its there somewhere. At dinner the previous night Donna was saying they had some over ripe bananas that they were going to have to trash. The Captain, in his best conserving mode, said that he could make banana bread from them and we could half the loaf! I had my doubts if he could remember the recipe but he said, "Of course I can!" So the next morning Rob brought the fruit over in the dingy and Captain G was locked in. I had to call my BFF, Jae, in Atlanta to try and get the recipe but she didn't know where her book was so he made it the way he remembered. It was great and everyone on 'Whimaway' were duly impressed (as was the Captain). The destination of Mission Beach and the state of the ocean - glassy. This is how far we had to motor in our little dingy - you can't hardly make out the town on the far shore. Dunk Island in the distance ... bags ready to load up for the motor back. We made it to Mission Beach - after a 40 minute motor in the little boat - replenished some necessary supplies like tomatoes and headed home. This morning 'Bogart' and 'Whimaway' left our little bay. We're not sure if we'll see them again on this trip. I've become so fond of everyone - especially Ian and Sharon and Pete because they've been here from the start - that I couldn't help but shed a tear or two as their boats disappeared into the distance. We've shared so much together - the times that you arrive at an anchorage or a marina and you know someone is there to welcome you or grab a line and help the boat into a berth, and the laughs and conversations - that it's easy to quickly grow great friendships. I think its people that makes cruising by boat such a special endeavour. Certainly for me, and the Captain, its what has made each and every day filled with so much to remember and cherish. I know we'll catch up again back in Sydney but, goodness, I miss them so much already. 'Whimaway' leaving Dunk Island with 'Bogart' a spec in the distance. "See ya'll later!" We're staying here today - there are a few walks on the island to explore - and we'll head on up north tomorrow and plan to arrive in Cairns on Sunday or Monday. Can't wait to see Tim in Cairns!